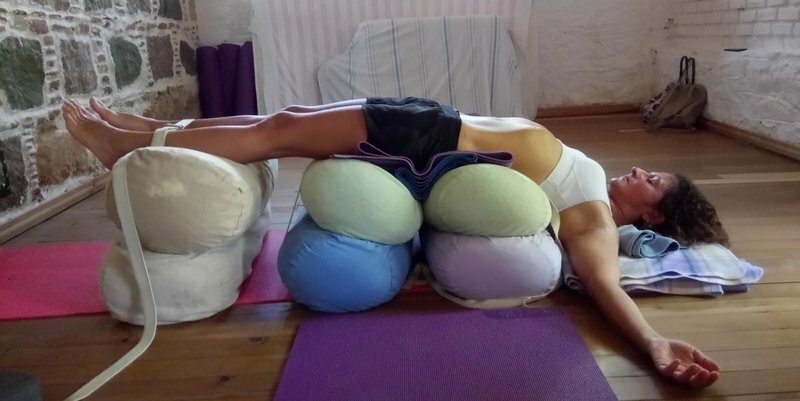 When practicing restorative yoga and staying in a pose, we support the body for stability and comfort. 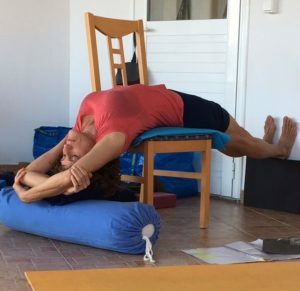 The question is where the body needs to be supported and where it needs to relax and let go. First, imagine what would comfort you when you are stressed or tired or perhaps in pain. Most likely support from a friend, a hand, soothing words, or something else would be comforting. Support and understanding will help you to stabilize, lean back and relax. Same principle applies to restorative yoga. Let me give you an example: Backache. 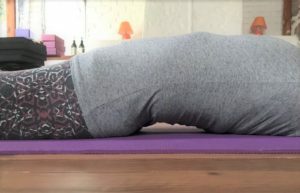 The muscles in the lower back might be tight for various reasons and the lower back might be arched when lying on your back in final relaxation. For this, raise the legs and support the calves (lower legs) on a chair. The arching most likely will disappear and the lower back will find support from the floor and will be able to relax down into it. 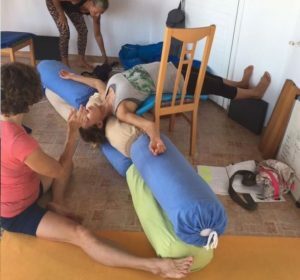 The most profound and efficient work in restorative yoga is the regulation of the somatic nervous system. The sympathetic (fight and flight modus) and the parasympathetic nervous system (relaxation) can be stimulated depending on which part of the body is stretched, supported or released. This way, the memories of stress held in the tissue, viscera and muscles can be addressed and dealt with. In modern trauma therapy this method is called ‘pendulation’, an oscillating between sympathetic and parasympathetic nervous system. This results in a healing process and is experienced physically as well as psychologically. Stress and tension are resolved and a feeling of inner balance and being in tune (harmony) with oneself takes place.